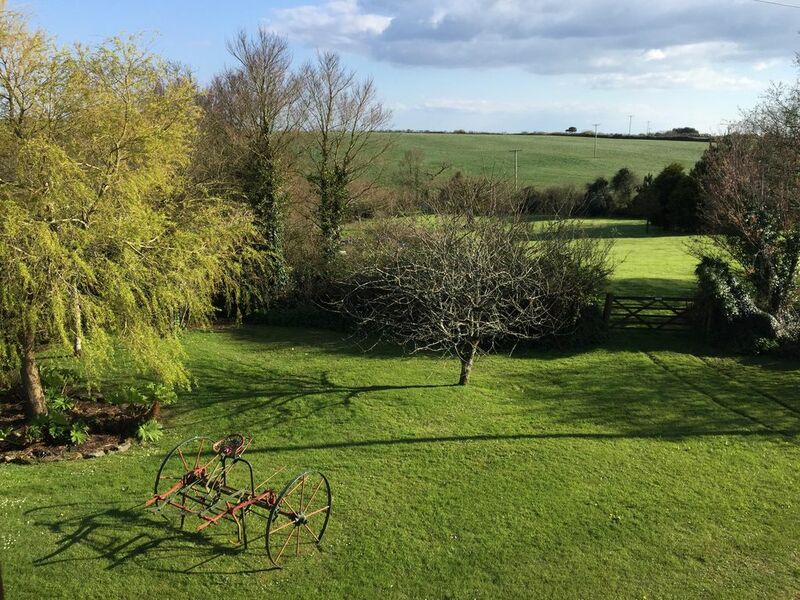 With delightful views over the surrounding countryside, Lamorna Cottage is a perfect place to relax, unwind and enjoy the best of South Cornwall, including numerous great beaches nearby. Part of an attractive stone barn on Tucoyse Farm (no longer a working farm) which dates back to the Doomsday Book. Period character features include stone elevations, wooden framed windows, broad slate sills and exposed beams. A comfortable and freshly-decorated lounge now with a log-burning stove and Smart TV, spacious dining room, newly fitted kitchen with washing machine and dish-washer. And upstairs (newly decorated) the bathroom and two bedrooms (double and twin) with new beds. Plus free WiFi throughout. In addition to our own large lawned garden there is a further gated lawn at the front, and French doors at the back opening onto a gravelled courtyard area with table and benches, perfect for an al fresco breakfast. There's also a stone plinth designed for disposable barbecues. We're just two minutes from Polmassick Vineyard; 1 mile from The Crown at St Ewe, a great traditional pub with good food; and 3 miles to the lovely beach at Caerhays Castle. The very popular Lost Gardens of Heligan are only 3 miles up the road, Mevagissey is 4 miles away as are at least 5 more decent beaches, each with its own character. The Eden Project is a short drive away. Waitrose has just opened up on the way into Truro, a cathedral city which has plenty of other decent shops. Tesco and Asda are also within reach. (One guest also arranged delivery from Sainsbury's). The coastal walking along the Roseland Heritage Coast between Mevagissey and St Mawes is one of the most spectacular stretches in the country, including hidden beaches and coves, tiny fishing villages and majestic sea cliffs (now designated an Area of Outstanding Natural Beauty). We bought Lamorna in 2016, and look forward to spending large parts of the year in this lovely spot. We live near Oxford, but have spent many family holidays in and around Cornwall. Walking the South West Coastal Path over the past few years, this stretch from Charlestown to St Mawes along the Roseland Coast stood out for its lovely beaches, spectacular cliffs and great villages. And the unspoilt rural lanes just inland make this the perfect location. We're planning to explore further over the next few years. We love being close to so much interesting coastline, combined with a peaceful rural base. You'll find a top quality digital radio (mono) in the kitchen, and can play music CDs through the DVD and Smart TV in the living room. Plenty of books - history, walks, novels, Cornwall, some current affairs. Monopoly, scrabble, Jenga, backgammon, jigsaw, Carcassonne, Checkers plus various card games! Around 20 DVDs in the 'library' - you may want to bring your own favourites along as well. Outside only (terrace and garden) please. Had a lovely time here. The cottage had everything we needed and we found lots to do in the area. We had wonderful weather for the last week of October, and spent most of our time outdoors walking sections of the coastal path along nearby headlands. The cottage was warm and welcoming to come back to, and even though the evenings were chilly we were kept lovely and warm with the electric radiators and wood burner. The cottage was well equipped, the wifi and the TV worked well... we couldn't have asked for anywhere better to stay to explore this part of Cornwall. We had a very relaxing family holiday; enjoying the beautiful local countryside. The cottage was a perfect base from which to head out and about. We had a wonderful relaxing stay at Lamorna cottage. It is ideally situated to explore The Roseland peninsula. The cottage was beautifully clean and had everything we needed. Would hope to visit again. Beautiful place to stay like being home from home, fully equipped with everything you need. Nice quite location beautiful views of the country side. Easy access to small coastal villages. Cottage fully equipped with everything you need, clean comfortable. As it was late September a bit cool the cottage was cosy and warm. If the weather was bad wonderful array of books games even jigsaw puzzles plenty to keep yourself entertained. I recommend this property highly peaceful place to come back to after exploring surrounding areas all day. This was our second holiday at Lamorna cottage and we enjoyed it just as much as before. It is a well equipped and comfortable cottage. Close to the South Cornwall coastal path and great beaches. Lamorna Cottage is in a peaceful rural location, a perfect place to relax and unwind. There are half a dozen beaches within 4 miles, and the Roseland Heritage Coast offering unspoilt scenery to explore, one of the loveliest stretches of the South West Coastal Path. The oldest vineyard in Cornwall is just a few hundred yards down the hill at Polmassick - great cream teas in the summer! We're just a few miles from the Lost Gardens of Heligan, Caerhays Castle and Gardens, Mevagissey, Charlestown and Veryan. A little further to St Mawes and Fowey. The Eden Project is only 10 miles away, and within just 15 miles the dramatic north Cornish coast - we love St Agnes and the brilliant Bedruthan Steps. Padstow/Rock is 20 miles, around 35 minutes drive. And not much further (in the other direction) to the beautiful Helford estuary, Tate St Ives, and - our favourite - Kynance Cove on the Lizard. Lamorna is a great base to explore Cornwall.